The only choice for quality kitchens & bedrooms in Yorkshire. The Kitchen is the heart of the home, a place to get the family together, have dinner parties or simply entertain friends. Here at Kitchens by Design we understand how important the Kitchen is, so we take our time to get it right. First we get a feel for how you work, live and play to best put together the perfect design for your dream Kitchen. Once we know you we will best know how your kitchen needs to be. 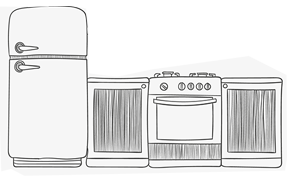 We offer an extensive range of Kitchens, Bedrooms, Granite, solid surfaces and Kitchen Appliances. Superior kitchens, bedrooms & granite worktops supplied and installed across West Yorkshire. Kitchens by Design are fantastic! Whether you require supply only or the complete design & installation, We are confident you will be happy with the design of the kitchen, the choice of kitchens available, the service you receive and the price we quote. To book a free appointment or for advise please don't hesitate to contact us. Simply call 01924 283783. The showroom is open Monday - Friday 9am - 5pm & 10am - 4pm Saturday and 11am-4pm on Sundays.